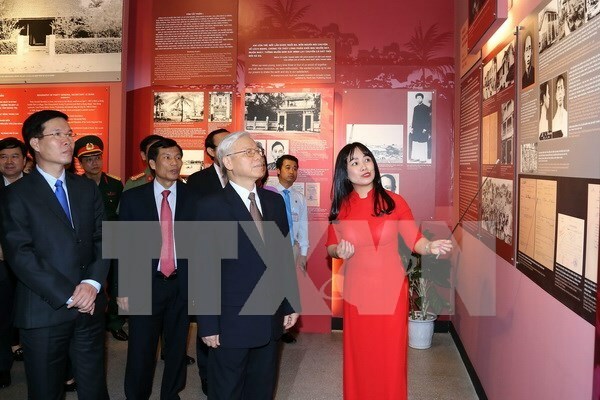 Hanoi (VNA) – Party General Secretary Nguyen Phu Trong cut the ribbons to launch an exhibition depicting late Party General Secretary Le Duan’s life and career in Hanoi on April 5. The exhibition is part of activities to celebrate the 110th birth anniversary of the late Party chief (April 7, 1907-2017). Nearly 300 photos, documents and objects chronicled the late leader’s revolutionary career as well as his contributions to the national liberation, building and defence cause. In the memory book, Party General Secretary Nguyen Phu Trong wrote that late Party General Secretary Le Duan is a steadfast communist, a standout leader, and a brilliant successor of late President Ho Chi Minh’s ideology and revolutionary cause. Le Duan, real name Le Van Nhuan, was born on April 7, 1907 in Bich La village, Trieu Dong commune, central Quang Tri province’s Trieu Phong district. He was the Party’s First Secretary and then the Party General Secretary from 1960 to 1986.